Best French chalk for conditioning both latex and neoprene neck or wrist seals to keep them supple while extending their life. 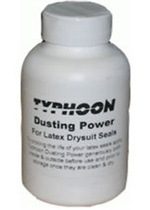 Similar to bathroom talc but without the scents which can destroy latex and neoprene. Excellent for applying to the seals before putting the suit on.